The world can be a scary place. While some things have known amounts of danger attached to them like riding a bike on a busy freeway or playing with matches near a gas station, sometimes you can’t predict what will happen around you. We can only do our best to be prepared to face the world for whatever is thrown in our faces, even if that means literally fighting for your life. While you shouldn’t have to worry about fending off a pack of wolves or taking down a roving group of bandits, the Kootek Tactical Flashlight Knife will make sure you keep standing even if you do. This is a XM-L Cree LED flashlight that has 800 lumens, a tactical knife, and hammer, all of which combined with a IP65 waterproof rating so you can take it with you camping. Or on a magical adventure to find an old man in a cave to give you a sword. 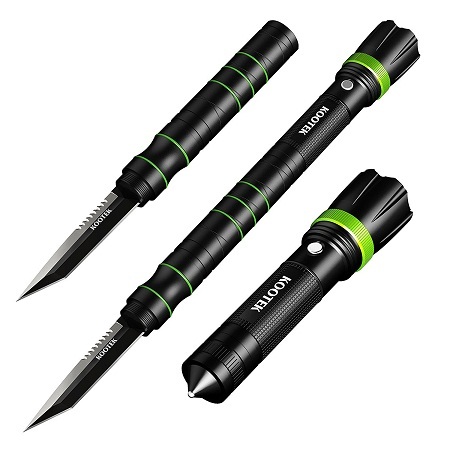 There are two configurations for this, one being a long flashlight and the other being a shorter flashlight with a 3.5” knife on the end. Made of aluminum alloy and stainless steel, this should hold up decently in spur-of-the-moment scenarios that need something sharp. There are three settings for the light, including high, low, and a fast strobe for random dance parties. There’s an included USB charging cable, though hopefully you shouldn’t need it too often, or bringing it camping would be troublesome.